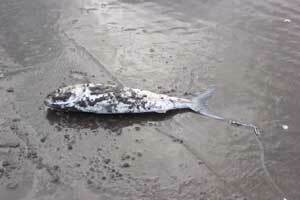 "Bugger", I missed the club day fishing at Muriwai on Sunday. On the Monday the wind is still right for the west coast, strong north to northeast. I had some catching up to do and did I ever! Three sets of 10 hooks produced 14 snapper, five gurnard, two sharks and one kahawai that finished up as bait. That is a catch rate of 73%. 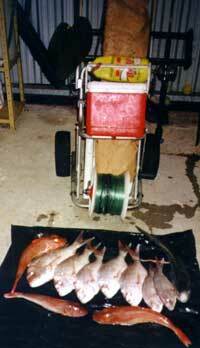 Six of the snapper averaged around four kilograms each. On the beach I had quite a group of Asian onlookers eager to help. Of course, when the second set came in and I had nine fish flapping on the beach from the 10 hooks set, the whole crowd buzzed around me like blowflies in heat. So I gave 3 gurnard and the 2 sharks to one gentleman who did not want me to return the fish to the sea. By using Paul's Target Hooks, not one fish was gut hooked. Actually, no trace has been lost either. My onlookers wanted to know a lot more about kite fishing so I wrote down our kitefishing email address a dozen times or so. I didn't mind giving the fish away either, I still had to carry over 30kg of snapper to the car with a smile. Muriwai again, I just love that beach. Forecast was for 25 knots of northeast winds gusting to 35 knots. Who cares about the gusts or the rain as long as the direction of the wind is right? Well, the met service was 100% right this time. It was a shocker of a day. Two more hardy kite fishers braved the elements as well. My first set with my Super Kite ended with the kite taking a dive of no return about 100 metres out, the cross spar broke. I retrieved the kite okay, no problems. I tried again with the Nighthawk Kite; this one also became very unstable in the gusty conditions and spiralled into the sea. Fortunately, while pulling the line back in, the kite took a wave as a platform and took off again. Having a float on the kites saved the kites both times. I pulled the whole lot back in anyway. A few more adjustments, I took the bottle float off and replaced it with 36oz of weights. The bottom weight on the mainline was changed for a Paul's "rolling weight" with 4 wheels. To increase stability, I put the bridle and drogue from my Flexiwing Kite on the back of the Nighthawk Kite and used the Flexiwing 10-hook section as well. The first set took off and did it ever go as the winds gusted to 35 knots. Casting a worried eye on the Nighthawk I saw it was as steady as a rock and making good progress. By now one of my fellow kite fishers had gone home, the other was having a go with the surf rod. The first set of the day produced two snapper, and one kahawai. I cut the kahawai up for bait straight away. The second set produced 2 more snapper, two gurnard and my first stingray, which made a right mess of my hook section. Not mucking around untangling this mess, I just replaced the hook section with a new 5-hook section and away it went again. All day it rained and rained, but who cares when you're catching fish! The third set was a beauty, three snapper, a gurnard and one trace bitten off hook from only 5 hooks set. On packing my kites away I noticed in astonishment that the cross spar on the Nighthawk had developed a permanent bow without breaking. Guessing that when the kite took a ditch and became wet it also became flexible and worked on the principle of the Flexiwing Kite. The picture above was taken in my garage, the first dry place I came to when I arrived home. It was another day of unsettled winds at Muriwai. From 3 sets of 5 hooks I managed 2 snapper, 2 gurnard and 1 kahawai. Nothing special, just a few fish to keep our interest in kite fishing alive. On the subject of kite fishing equipment, I wonder how my fellow kite fisher without a 4-wheel drive can get their gear to the beach. At my age, 65, I often wondered if today is my last day at the beach. Fishing by myself there is a lot of gear to carry, the reel, the kites, the trace rack, float bottle, bait box or chilly bin, hand reels, weights and all the bits and pieces you need for the pleasure of kitefishing. The way I solved this problem is I found this golf trundler at a second hand shop. All aluminium, wide wheels and feather light. The way it is loaded it is perfectly balanced. It is still a little hard to pull but only if I go up over the dunes. We used a mixture of salted mullet and salted bonito for bait and generally caught four or five fish per set except for the second set that had about nine dogfish on it. Due to these critters being about we lost about 15 hooks and a number of floating beads. For a bit of a sideline we rigged a boat rod with a couple of hooks to a downrigger clip on the kiteline and dropped it out behind the surf during a couple of sets. This got us a couple of good strikes and a kahawai. I ordered two of Paul's kites last year and finally got the wind going in the right direction for my pocket sled. I set three hooks and put on some kind of rockfish for bait. WOW, I never had so much fun. I couldn't believe I was actually kite fishing. I am from America but live in Japan and they don't do any kitefishing over here. If they do I've never seen it. Anyway, I put out three sets and the first two got nothing but the third produced a shark. The locals couldn't believe it. 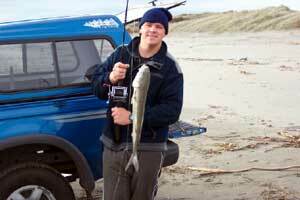 They were wondering what I was doing with a fishing pole next to me and me looking through binoculars out to sea. They had no idea I was fishing with a kite. I was having a ball and my wife was amazed that the whole system worked just like Paul's Fishing Kites video said. The video was so helpful. Back to my shark story. During the last set it was time to reel in to see what we got. Well, the line was so tight I thought if I pulled any harder the line would snap. It was out about 200 meters and I knew it was snagged on something. I couldn't believe I was on the verge of losing my kite, gear and possible catch so I decided to swim out there and free it up. Yes, this is how crazy this kite fishing stuff made me. The water was real cold. I swam out with scissors in my pocket just in case I had to cut the rig line. My wife was watching all the time with binoculars. I got out there, pulled the line free with a good pull, and felt it give. I could tell there was something there by the weight of it. It didn't move so I thought it was seaweed. 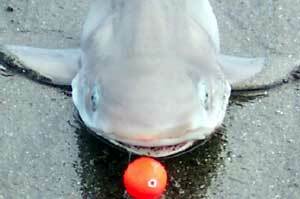 I got to shore pulled it all in and low and behold a shark. My son was so happy. 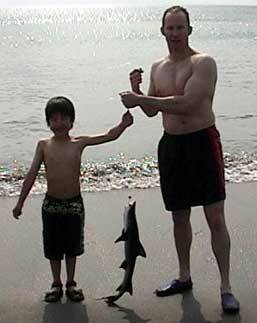 He had always asked me if every time we go fishing if we are going to get a shark like the video did. I took pictures and will send them also. It was my first time and to get a shark was just icing on the cake for me. I just can't wait to go out again. P.S. I could swim out this time because of the calmness of the water and the distance was only about 200 meters. What should I do if its snagged and its out farther and the water is rough? How do I save my kite at the least? Ed : The safety trace between the hook section and dropper line should be 10% weaker than the line between the kite and reel. If snagged the safety trace should break losing the hook section but allowing the kite to be retrieved. Personally I would never swim out to recover fishing gear after being tangled in it several times when I was a commercial diver. Aaron & Petra Buxton just recently took up kitefishing and decided to take their new Flexiwing Rig to Orewa last weekend. They baited up their 4/0 Target Hooks and set the rig out the full distance. On just one set of 10 hooks they wound in eight nice sized snapper. 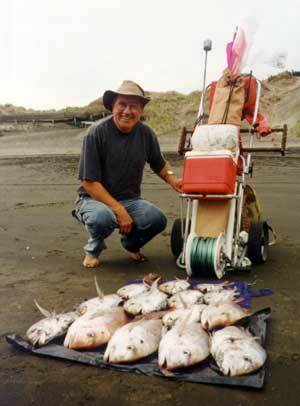 Recently fishing at Muriwai Francis set out his rig powered by his new Power Chute kite and was amazed by the pull. Even though the rip was causing problems for other kitefishers using longlines his powered out dead straight to 1000 metres and was even occasionally lifting his 4.5 litre float bottle, which was three quarters full of water. Francis was using fresh mullet for bait and he wound up with 3 snapper and 10 gurnard for the day. He said that in the marginal conditions the power chute performed better, and had more pull, than all other kites he had used. Geoff Preston and Tony Johnston have had a fantastic week. Tony caught a 10.5kg snapper on Saturday, and that put him at the top of the monthly ladder at the local fishing club. Tony was also averaging 10 to 15 gurnard per set. On the same day, Geoff caught 21 fish from a 25 hook set, 18 were gurnard and three were school-sized snapper. Just yesterday, Thursday May 29, Geoff thought he had the lead in the local competition with a huge snapper he caught in very marginal conditions. The surf was huge and an ugly break made setting difficult, then almost the second the gear got out to full distance, the extremely light offshore wind changed to an onshore south-westerly and brought the Mega Mouth kite down in the lull that preceded the wind change. Geoff runs two safety floats on his mega mouth kite and managed to retrieve the kite and all the gear intact along with the big snapper and a couple of gurnard. When the fish was weighed later it came in at a very respectable 9.75kg, just under Tony's. Despite what the weather forecasters say, the wind at Mokau normally blows very lightly and offshore until 9 or 10 am and then the wind will shift to the predominant direction predicted for the remainder of the day. Tony and Geoff both use the Paul's Fishing Kites Mega Mouth and Power Chute kites on bottom longline rigs in order to successfully fish these very light early morning breezes. The wind was a moderate easterly and we set our Kite dropper rig baited with squid but had trouble with the rip. We only set ten hooks once and we caught three kahawai for the day. 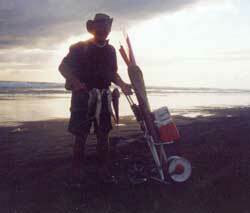 Ed : I have never done well at Muriwai on squid baits. Hope you check the links in this newsletter find out how to beat the west coast rip. I recently went to Muriwai two kilometres up from stream. We had a nice northeaster of 10 knots but the kite longline rig got caught in the dreaded Muriwai Rip. Any suggestions or help please? We did pick up a gurnard and a kahawai for the smoker!!! A Skyhook will increase the pull and improve you chances of beating the rip. A Power Chute kite will vastly increase the pull and will beat all but the worst rips in very light wind conditions. The Mega Mouth kite provides so much pull that most people can't pull them down in winds over 15 knots (they walk them down). A Mega Mouth kite WILL beat any rip in winds over six knots. The running shot is a clever method of beating the rip if you don't want to purchase another kite. Rolling Weights allow the kite to tow the mainline out more easily and sometimes those with rolling weights don't use a float bottle further reducing the effect of the rip on the rig. Read Francis Sewak and Geoff Prestons reports in this newsletter re power chutes and mega mouth kites. Kite Fishing Report from U.S.A.
Mike Suarez of Maryland, USA, recently reported that he was using his Flexiwing Rig earlier this month in Cape Hatteras and caught a couple of large Blue fish and some Rays.